I just finished! It took awhile, especially that last level. I got a bit frustrated near the end trying to figure out the switches and going back and forth in the slime, but I was able to beat it without cheating. I'd say with the ammo and health placement and the amount of BWAs, Quadrumpi and Super Cyclopti my playstyle could best be described as "open door, alert flemoids, shoot and duck out of the doorway until they're all gone"
And 75, haven't heard of Empyrion so I'll have to check that out. One wad that came out recently that I'm still playing through is Ancient Aliens, I was wondering if you've given that a go. It's probably more similar to the levels I like rather than the ones you like, but the visuals I think are quite pretty regardless. One wad that came out recently that I'm still playing through is Ancient Aliens, I was wondering if you've given that a go. It's probably more similar to the levels I like rather than the ones you like, but the visuals I think are quite pretty regardless. I tried it, it's well made but... you guessed it, the gameplay isn't really what I'm into. I played through the first few maps and got burned out on the gameplay pretty quickly for more or less the reasons I mentioned before, and then I skipped around to different random maps in the pack and nothing really caught my attention. I just played with -nomonsters to look around after that. I'm kind of surprised that I didn't like the fights in this as much as Valiant, since it was the same guy (skillsaw). I can go into more detail on the combat/record demos if it will help. The maps look good but he tends to put brightly colored neon lights everywhere which I don't like. I guess it's meant to give it a sort of cyberpunk feel but to me it just sort of looks like Christmas in Las Vegas or something (I couldn't really get into Far Cry: Blood Dragon for the same reason). The sky textures are really great throughout, though. 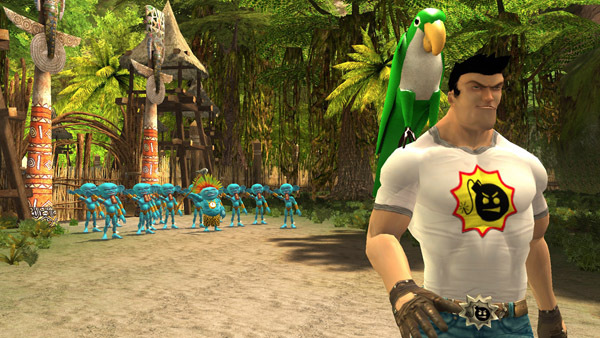 I really like seeing FPS games with lots of color but I guess I prefer stuff like Serious Sam which focuses more on creating a lush environment (that's sort of why I quoted Kodachrome in my signature) rather than accenting walls with brightly colored lights. Personally, I prefer Epic 2's theme, which made a more realistic looking Egyptian environment. I guess I would have liked this more if he left out the metal and neon lights and made an ancient themed map set taking place at sunrise (maybe with purplish natural lighting / torches). The starting area of MAP26 is a good example of what I would have liked instead of this neon lights thing. Though I know this is Ancient Aliens and I guess the neon lights fit into that. By the way, I think it's awesome that you can actually go into the UFOs. MAP24 is my favorite map visually (it's really impressive and I'd like to see more maps use this theme). MAP25, 26, 27, and 29 I liked because they kind of have an abstract theme (floating blocks, and other bizarre / impossible architecture). So, I couldn't remember where I got lost, so I said why not just demo and replay it? @75 Haha no need to go record anything for me, I was just wondering what you thought. I'm a fan of that retro neon 80s type of look so I think the colors are fun rather than trying to be serious and realistic. I was a pretty big fan of the way things looked in blood dragon too. The whole desert-Egyptian environment I wasn't too big a fan of but it didn't get in the way in my opinion. I'm also a big fan of abstract maps (been kinda wanting to make some for Chex) so I guess I have some to look forward to. I think the whole ancient alien things was kinda a joke at first but then they put effort into the maps, so I half treat it as a joke but also as a challenge. @noob what source port did you use to record this? I tried zdoom 1.8.2 and gzdoom 2.2 and they both went out of sync. EDIT: Recorded my E1M3 demo FINALLY, after multiple deaths and realizing that I couldn't start a demo from a saved game. Oops. I'm now to E1M5. And whoa. Edit: appears to be a gzdoom thing. I guess that's what I get for testing on zandronum! I'll fix it in the update. Although for the record, the first time I played E1M4, it took me a long time to figure out that the switch for the lift to get back to the red door was right next to the lift. Edit: appears to be a gzdoom thing. - (g)zDoom has fragglescript support, whereas Zandronum doesn't, I think it just ignores all of it. - I'm not sure if Fragglescript is going to be added in in later Zand releases, to be safe you should probably remove the Fragglescript code you don't need. Roger that, it'll be a simple fix. Finally done with E1M5, lol. That took awhile, and I guess I didn't get as lost as last time. I guess what had confused me were all the various lifts for the blue and yellow switches. And I had forgotten that there was that lift which was blocked by the blue and yellow columns. Sorry for the bump, i wanted just say, i have finished this expansion and it was awesome, the level design is really cool, the amount of enemies stressed me sometimes, especially in the 2 last maps. I have played with difficulty 4/5- 1life per map but with the mouselook. Have you made some other projects ? Cool video, but you shouldn't post in topics that are more than 2 months old.